« Water Off In the Morning! Beautiful weather we have been having! 80s with lots of sunshine. Just right, especially if you’re standing in the water with a fly rod! Generators have been off every morning until noon or 1:00 p.m. Yesterday they turned them on a little earlier, but that’s a Monday for you. Back off again this morning. Fun day on the water last Tuesday. 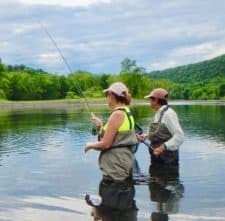 Fortunately, the water was off so Jim and Carolyn took a group of seven out for a half day of wade fishing. Grandfather, sons and grandsons….from 7 to 70. Four out of the group were new fly fishers so we worked with them for a while on casting, hook set and playing the fish. Everyone caught fish! 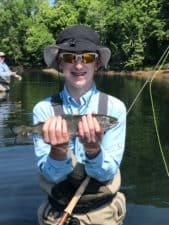 Great seeing the young men having so much fun with a fly rod. When the horn blew, the new fly fishers left the water and Jason and his sons drifted on down for the balance of a full day with Jim. wanted to work on her casting, which we did. But, most of the time they were catching fish. Started out with the ruby 2. Both wanted to get some streamer experience, so we switched to the tiger tail on the sinking leaders. Both the 1.5 ips and the 3 ips leaders were working well that day. So then they started catching on the tiger tail. Another fun day. Monday, Stan took Peter out for half a day. We always say to take the Monday SWPA projections with a grain of salt as it is difficult to predict what you need to do three days ahead. As usual, their projection of no water until 1:00 p.m. fell on it’s nose. At 10:00 a.m. they turned on a low one unit and bumped it up some more at 11:00. Until that time, Peter was hooking up on the ruby 2. Fishing definitely dropped off with the rise of water flow. But, it was a beautiful day on the water and Peter caught some fish and had a nice get away for a few hours! 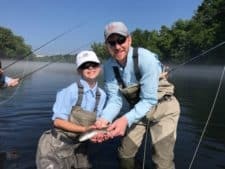 This entry was posted on Tuesday, June 5th, 2018 at 9:40 am	and is filed under Fishing Reports. You can follow any responses to this entry through the RSS 2.0 feed. You can leave a response, or trackback from your own site.